After sitting around for the past two weekends I really felt the need to escape while still staying off my ankle as much as possible. My husband offered to drive us to Door County for the day and I did not hesitate one second to except his offer. 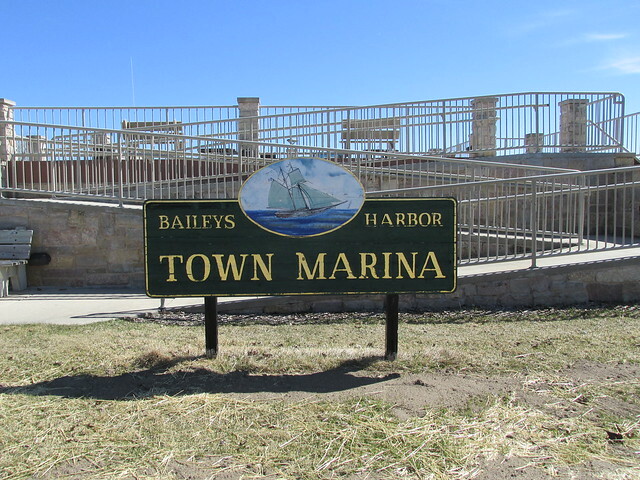 We started out at a marina in Bailey’s Harbor for a little fishing. I relaxed on a bench while he attempted to catch “the big one”. Even though the sun was shining brightly, it was cold and quite chilly. After fishing for a bit we headed over to a shop that I had seen on my last trip and really wanted to check out. I felt very out of place entering an active lifestyle store in a boot up to my knee. Although, I believe I will soon be on my way back to the active lifestyle I am accustomed to. 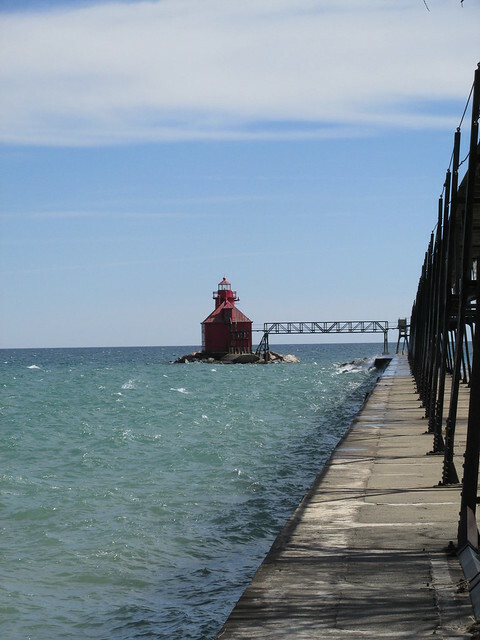 We then did lunch at our favorite pizza place, stopped at Peninsula State Park to get our 2015 entrance stickers and made our way back toward home but not before stopping at the Sturgeon Bay Coast Guard Station and lighthouse for a little more fishing. Since my husband walked all the way to the end of the pier to fish, I decided to sit and enjoy the beach. It ended up to be a beautiful day away from home. Today my husband and I decided to head outside and take a hike, find some winter geocaches and enjoy the fresh air. Aren’t you shocked? I will admit, I was not all that excited about this adventure but I really needed the break from routine. You all know I am not a winter weather lover but thankfully I do own some cold weather clothing for when the urge hits and I just need to get outside. Today we hiked about 3 miles on the snow covered Ahnapee Trail starting in Forestville, WI. 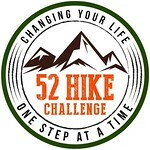 We started and completed many miles last winter and hope to finish this trail this winter. 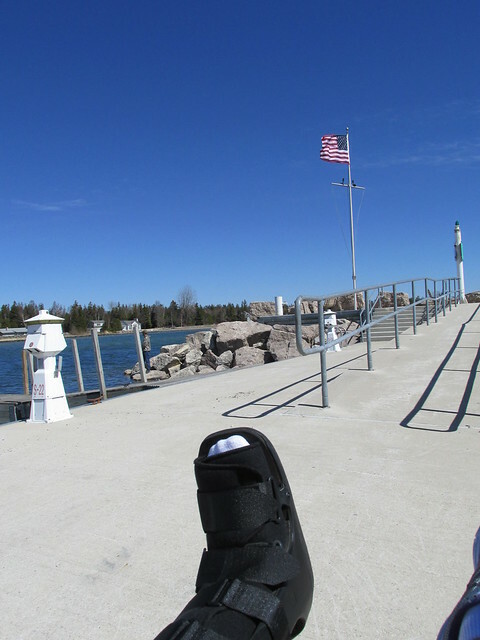 We have from Forestville to Sturgeon Bay remaining and today was as good as any to venture out. Here is a unique hiding place for a geocache. I personally love this trail. Any trial that follows a river or stream is just so relaxing for me that I often feel I could walk forever and never get tired of the scenery. It ended up to be a great few hours together away from the big city and all the craziness of this time of year. Even though I had more layers of clothes on than I prefer it was great to be outside. I also need to add that the best part of this whole day had to be when we arrived back at the parking lot. We noticed that the park where we started our hike had a bathroom building on the premisses but at this time there was no need for a visit. By the time we returned to the car, I asked my husband what his thoughts were on that bathroom possibly being open. He laughed and said it was very unlikely, which I knew. So we changed out of our boots, drove up to the bathroom and I noticed there were no footprints in the snow leading up to the bathroom door but I still had hope. He got out and tried the door and I couldn’t believe my eyes when it actually opened. It is December in Wisconsin. No public park bathrooms are ever open at this time of year. He even took a quick look inside and announced that they even had it stocked with toilet paper…..OMG I was a happppppy hiker!!!! (Even though I do carry toilet paper in my backpack for emergencies) This really made my day. Although I don’t consider myself a full time mom anymore to our now grown 19 year old son, I am somewhat of a substitute mom to all my daycare children. That being said, whether I am a mom to my own child or doing my job, all mom’s needs a day off once in awhile. And that is exactly what I did on Monday, took a day off and had some fun with some friends. I started my day with a little me time at the gym, alone and very early. My favorite time to workout is mornings and I rarely get this opportunity so I took full advantage of it. After that is was home to get ready for our day of fun in Door County, WI. I have visited this area more times than I can remember and almost always spend most of the time hiking trails or on the water doing something water related. Today however, was all about food, shopping, and wine tasting. No need for hiking boots or paddles but I was ok with that. Our first stop was a new coffee shop in Sturgeon Bay, WI called the Glas Coffee House. I had already had my fill of morning coffee so I went with a blueberry smoothie which was perfect after my awesome morning workout. After this it was time to go deep into the Door County experience and shop. All three of us are foodies so we were literally like kids in a candy store. We tasted dips, salsa, olive oils, balsamic vinegars, BBQ sauces, cookies, cherries, and of course WINE!!!!! 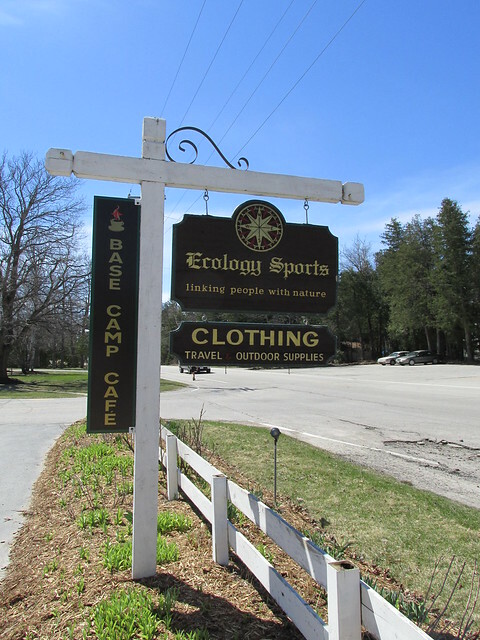 We did sneak away and explore a few of the other shops with some authentic Door County art. Then somewhere along the path we came across a very special holiday shop that is decorated year round with Christmas decor. And I’ll be honest, walking into this shop in the middle of July was against all my morals but I did it. (You will all understand why if you remember how much I dread snow, cold, and winter.) I will also admit, the Christmas music that was playing sent a shiver down my spine but the decor was very, very beautiful. We did take a short break and have a real meal in between all the culinary delights we tasted and ate at the Chef’s Hat in Ephraim, WI. My meal of choice was the gorgonzola roast beef sandwich with potato salad. It’s like a party in your mouth, it’s so good. Door County has so much to offer that I know we could never see it all in one day. However, we saw quite a bit of it. 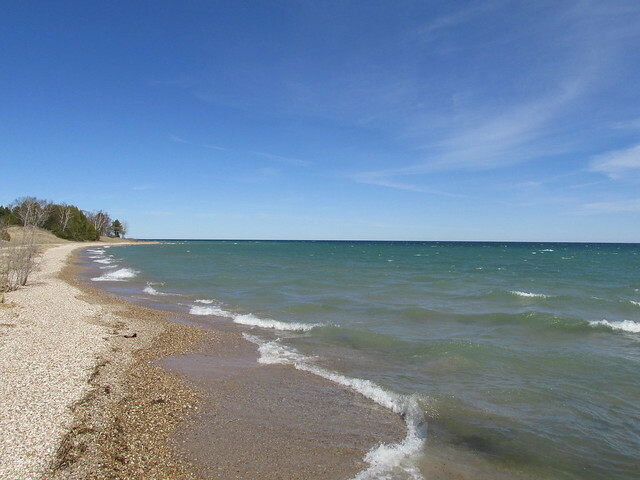 Eventually, I hope to get the girls to visit and venture out into my world a bit and either do some hiking or explore by water but until that happens a glance at the calm waters of Door County was not far from my sight. To finish off our day, we had the pleasure of stopping in at the cabin of one of the women I spent the day with and sharing a dinner of all our Door County treats. WARNING: VERY UNHEALTHY MEAL….but so worth it! Yes, believe it or not, this was what we ate for dinner. Cookies, chocolate covered cherries, port wine cheese, crackers and wine. It was awesome. Have you ever been to Door County, WI? What was your favorite activity you did while there? This past weekend we decided to brave the cold and venture out for some ice pictures. With layers of long underwear on we headed to Door County and were rewarded with some very beautiful sights. Our first stop was the coast guard station in Sturgeon Bay. We exited the car and were hit by a brisk wind that made me start to shiver immediately. We proceeded to walk out to the pier and I was amazed at the depth of the ice along the shoreline. We were not able to go far because of ice covering the entire pier but I was not disappointed. It was so windy that I was not sure how long we would be able to tolerate the conditions. After my son finished with his pics we headed back to the car and drove further to our destination, Cave Point County Park. This is one of our favorite places to visit in the summer months. You can walk along the beach, enjoy the nice cool breeze and take in the gorgeous rock formations. In the winter it’s a whole different terrain. Ice, ice and more ice. Even with the ice making walking very difficult the views were breathtaking. There was even a spot along the shoreline where my husband and I found a rock not covered with ice in which we took advantage of and just sat down and enjoyed the bright sunlight for awhile. Thankfully the wind was from a different direction here and we were pretty comfortable compared to the Sturgeon Bay pier. I cannot even explain how good it felt to be outdoors, breathing fresh air and away from my home for the first time in months. If I did not already have spring fever before, I really have a bad case of it now. NOTE: All the pictures in this post are courtesy of our son. Every summer I take a day off of work to spend with just my son. No one else is invited to join us, it’s just him and I. This summer was just a little extra special because I figured since he was 18 now, he would not want to spend a day with his mom. Then just a few weeks ago he surprised me and said he still wanted to have “our day” so we did just that. It started out as always, a trip to the dentist bright and early. From there we headed to Door County with the truck loaded with one kayak and the stand up paddle board. Our first stop was Door County Coffee for a treat. He ordered the orange creamsicle , and I had an iced latte. We arrived in our favorite town, Ephraim, about 9:30am. We unloaded and started paddling. It took us about and hour to reach the island we had as our destination. When we got there we switched and he paddled the board back and I took the kayak. When we returned to the beach we beached the kayak and just had some fun with the board. After a few hours, it was time for lunch. We loaded up the truck and changed. Then headed to our favorite restaurant. The Chef’s Hat. We fell in love with this restaurant a few years ago, and just can’t say enough about the freshness of the ingredients. This is one spectacular place. We both ordered the same sandwich, roast beef gorgonzola melt. This comes on a black bean salsa bread which is so different but adds so much to the sandwich. Oh, and we also had to order one of the huge cinnamon rolls they have that we share every year. Yes this is terrible for me, and yes I know this. Regardless of what I think, my son says that there is 365 days a year and this is the one day I need to just say “screw it” and eat some fattening, not very good for me, food. I try, really I do, but the guilt drives me crazy. I did eat my half, and then it was time to burn it off. We headed to Peninsula Park next. They have a tower we like to climb and look out over the water. You can see quite a breathtaking view from up here. Next it was time to pick up a few things that I can only get in this area, olive oil, wine, and some blueberry jam. Of course, now that it is a few hours later, after our terrific lunch, he suggested we go for ice cream. Real ice cream, which I typically don’t eat either!!! I knew I would get the same lecture 365 days a year and……… yeh yeh whatever, let’s just go. So we arrived at Dippy’s Ice Cream Shop. Oh my,what to have. So many choices. I knew healthy was not an option, so I just did it, said screw it, for my son. I had “cookie dough” and he had “heaps of love” ice cream in a waffle cone. At least we walked while we ate so technically we were burning the calories as we were putting them in. (Although we probably should have jogged) We walked all the way to the end of the street to the beach and sat on the stone wall over looking the bay and ate our wonderful cones together. That’s when it struck me. I can burn the calories off from today on another day. I may never have this moment again with my son. I just simply enjoyed the moment for what is was. All in all it was a wonderful day we had together. Hopefully he finds time to be with his mom in the summers to come. Although, if not, I have some great memories of the ones we have had already. A week or so ago, I watched a local news station visit the farmer’s market and interview two people. One was a local restaurant owner that offers Cajun cuisine. At the market he said they offered alligator sausage on a stick and alligator sausage wraps. So you know what I thought of immediately…..DATE NIGHT!!! Gator wrap was the entree of the night. The gentleman at the window said they sell out each batch they cook in usually about 3 minutes. All I could think was, was there actually that many people that would actually try this???? Well, here is what he was served. Now there was nothing on this particular menu I would even consider eating, so I went and found a filled pita, called a Lazy Chicken. Which essentially, was just a small chicken and pepper filled pita. We took our entrees and found a quiet spot next to the river to enjoy our choices. My pita was good, and my husband said the alligator was not what he expected, but was also good. Then he made me try a bite, against my best wishes. Oh gosh, I took my bite, chewed twice and then the thought hit me, I WAS EATING ALLIGATOR!!!. It was like one of those television shows you see where they are in a competition and have to eat 10 cockroaches in 30 seconds, well, chew fast and swallow is what I did. I can’t really say what it tasted like to be honest, I just needed to get it down, and fast. After eating, we headed back to find the other tent that was interviewed in that same news program. A gentleman that sold jams. Precisely, Carrot Cake Jam. It did not take long to locate him. I remembered what he looked like in the interview, so I was on the look out. When I came across the tent called, Hippie Wayne’s, I knew that we had found it. He had so many different jams that no one else has. I wanted to purchase many, but settled for one. I love carrot cake but never seem to make it for whatever reason. So, this was perfect. Easy, already made, and hopefully great on an english muffin. We shall see in the morning. It started to rain just as we were headed back to the car. Perfect timing. One more day of work for me and a trip to Door County for fun. I can’t wait. And then the weekend. Water levels are looking better everyday, so hopefully we will get some paddling in this weekend.